This morning’s hymn is Sine Nomine, No. 641 from the English Hymnal, and is chosen in honour of those participating in today’s strike of some University staff. Officially the 5-day strike comes to an end today and the City clean workers are supposed to return to work tomorrow morning, but on a “work to rule” which means the backlog will not be cleared over the weekend. For next week the strikers have made plans for what they call “strategic action”. There are basically three groups of workers involved in the dispute: (i) refuse truck drivers; (ii) refuse collectors; and (iii) street cleaners. The plan is that groups (ii) and (iii) will go back to work, but (i) will remain on strike. This means that groups (ii) & (iii) will turn up for work, and receive full pay, but will be unable to carry out any of their duties because of the absence of drivers to drive the trucks essential for their operation. In effect, the Council Tax payers of Brighton & Hove will be paying for two out of the three groups but not getting any work in return. Presumably future action will rotate these groups, with a similar result. People can make up their own mind about this tactic, which is intended to ensure that CityClean workers do not lose their entire income while on strike. My view, for what it’s worth, is that it is both cynical and immoral. 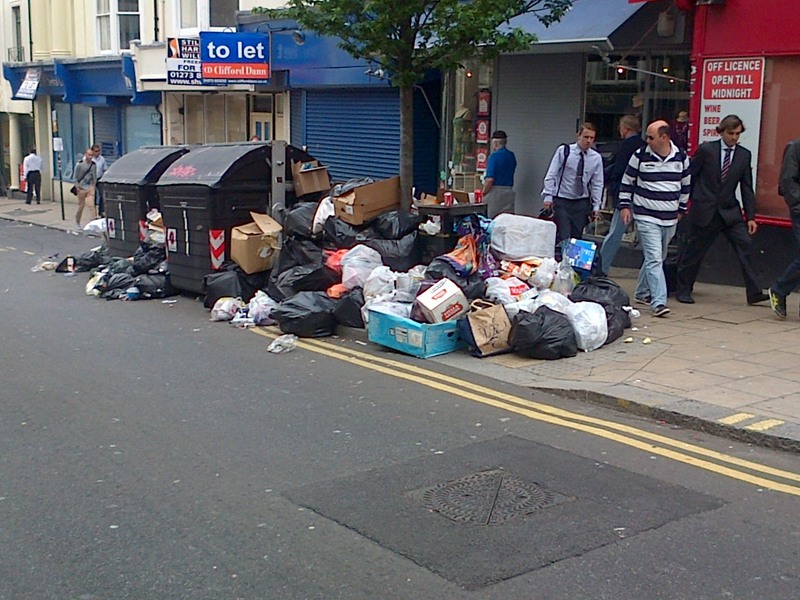 Effectively, the CityClean operatives are planning to help themselves to Council Tax payers’ money in order to fund the strike, while still expecting the general public to endure the stench and filth generated by their decision to withdraw their labour. I began with some sympathy for the strikers, but I’m afraid if they persist in this action that sympathy will disappear entirely. A strike is a strike, but the plan for next week is not a strike. It’s a scam. 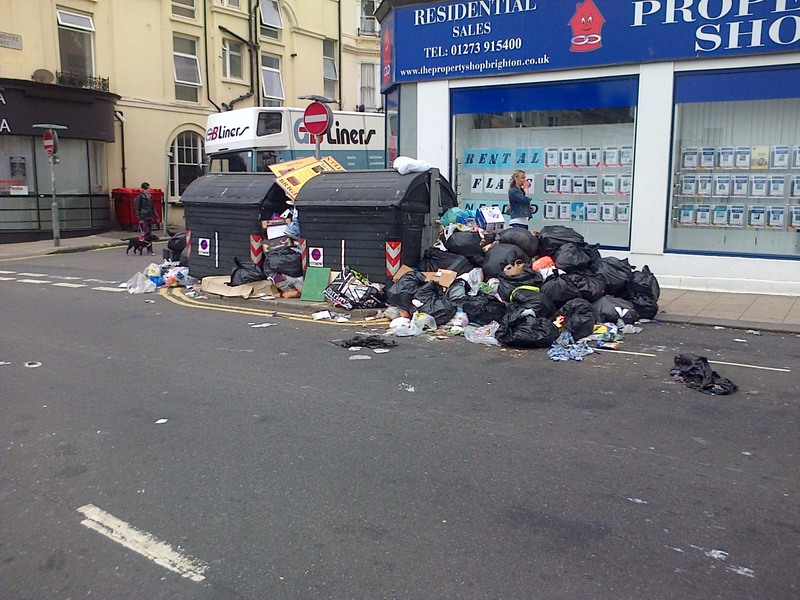 Meanwhile, the other party to the dispute, Brighton & Hove City Council, is doing exactly nothing to resolve it. The strikers action, however, is not hurting them, it’s hurting the ordinary people of the city. It’s just a question of time before someone is injured (e.g. by broken glass) or contracts a disease from the rotting garbage littering the streets. Hundreds of small businesses, already struggling with the recession, many of which are dependent on the tourist trade for their income, will be forced under. The selfishness and intransigence of both sides is unconscionable. 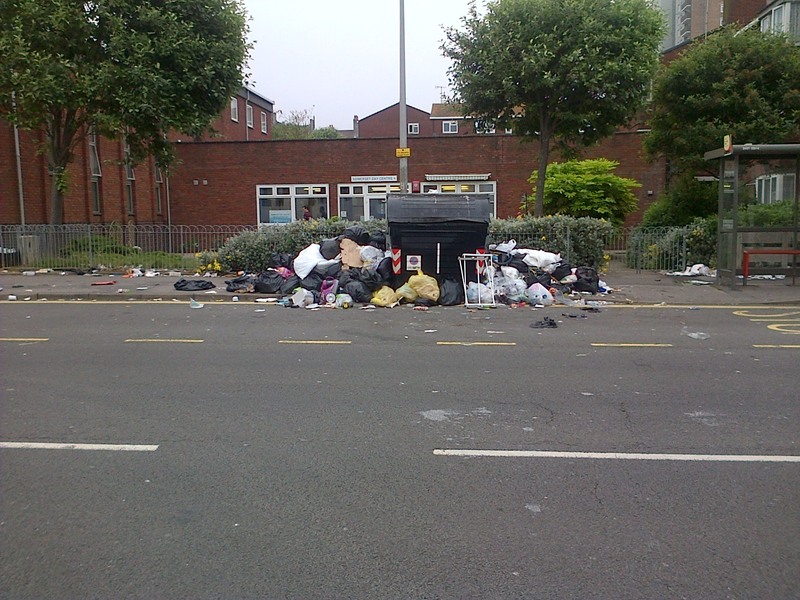 Moreover, the Council has a statutory responsibility to provide a refuse collection service, which is is clearly unable and/or unwilling to do. We’ve reached the point where the national Government should intervene. And quickly. 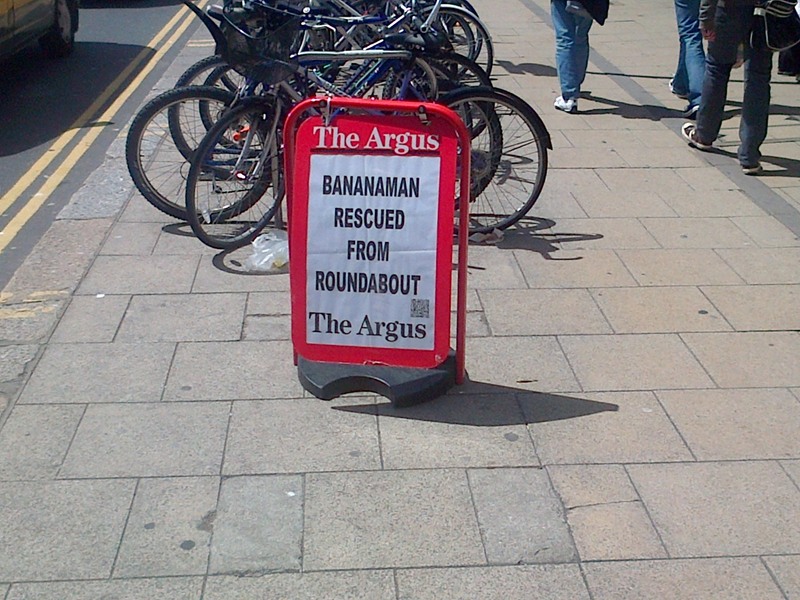 As Brighton and Hove’s recycling, refuse and street-cleaning operatives begin their strike, the Evening Argus takes an unorthodox view of the dispute.. 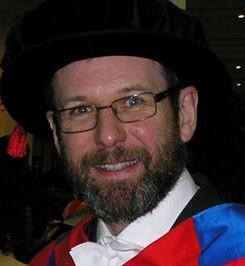 The current pay dispute at Brighton & Hove Council highlights all that is wrong about so many trade unions, who instead of looking at the bigger picture, concentrate on the needs of a small number of people, usually men. As I understand it, the Council’s current plans to equalise pay will see many women earning more, but a small number of workers, mainly men, will be worse off. Why aren’t the unions scandalised that all those women have been underpaid for so many years, (and at least 4 years since most other councils sorted out ‘single status’), and why aren’t they seeking compensation for all that pay that those women missed out on? Now that would be a good campaign! This morning’s hymn is Sine Nomine, No. 641 from the English Hymnal, and is chosen in honour of all those participating in today’s public sector pension strikes.